“Be Amazeballs!” Go Jay! Go Family! Go Michele! Weeks before his 6th birthday, Jay was diagnosed with Leukemia. Jay and his family, now known as #TeamJay, held on to hope, and fought, and pushed through. Like most boys his age, Jay wanted to have a birthday that was “amazeballs.” But since the diagnosis, because of treatments, Jay wasn’t able to celebrate the two birthdays that followed the way he and his family wanted. Well, guess what! One year ago, Jay was declared CANCER-FREE! 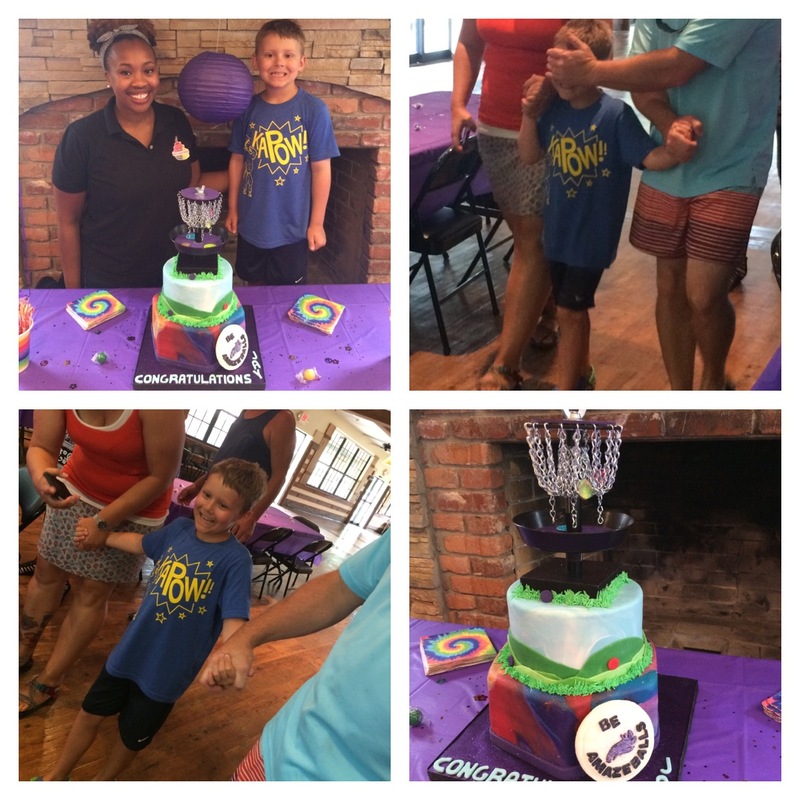 This year, thanks to Jay’s amazing family, the non-profit organization, Icing Smiles, and Michele A. Holmes, an Orlando, FL-based cake baking extraordinaire and soon-to-be guest baker at Feed The Chef, Jay and his family were able to celebrate Jay’s one year cancer-free! Go Jay! Go Family! Go Michele! “Jay loves tie-dye, the color purple, glitter, the phrase “Be Amazeballs,” and frisbee golf, said Michele. “First of all, I had no idea what frisbee golf was, but I was not gonna let Jay down.” 10 hours later, the decorations were done, and the icing made the cake almost impossible to resist before transporting it. “He was thrilled that the disc golf goal on top was real and he could actually play with it. I was just happy to see him smile. Today was a great day for me,” Michele finished. Being such an amazing volunteer with Icing Smiles, Michele was awarded their Sugar Angel title. Jay’s absolutely fantastic mother wrote, “Jay had a very special one year cancer-free party today with his family and a few very close friends. Other than all being together, the highlight of the day was this cake! !” We love it, too, Jay’s mom! Michele A. Holmes, owner of Skye Confections, creates the most amazing cakes ever seen for all occasions. And she’s only getting better. Order your cake today! We look forward to having her on Feed The Chef!